JCrow Coaching – WHAT STORY ARE YOU LIVING? There’s something about conversation – and by that, I mean rich, authentic, deep, meaningful conversation – that satisfies and fulfills. It’s the kind of conversation we long for, even if we don’t realize it. That’s the kind of conversation that happens every time I coach people – individuals, systems, relationships, groups. 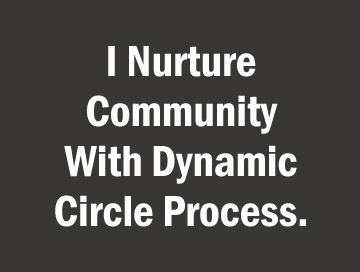 That’s the kind of conversation that emerges with the circle-based process I facilitate using coaching circles, community circles, management circles, leadership circles, story circles – any circle of people that gathers purposefully for meaningful conversation and action. And that’s the reason I love coaching. I believe my role as coach, whether I’m coaching one person or a large group, is to be an objective thinking partner, to listen deeply and to forge a conversation that’s open, honest, and focused on whatever goal you’ve identified as important. It strengthens and encourages participatory leadership – a leader in every chair – and creates the perfect structure for that to happen. It slows conversation so everyone listens with attention and speaks with intention, giving each voice a chance to be heard. It nurtures relationships, fosters community, and holds conflict with caring and empathy. It’s what I do, and it’s what fulfills me. How can I help you today?